Vacuum furnace technology was developed for very high quality applications. A pressure vessel is pumped out with a vacuum pump to produce a pressure less than atmosphere. (A vacuum by definition, but no where near a ‘perfect vacuum’.) In most applications, another gas is injected back into the vessel. The gas aids in heat transfer and aids in other surface treatments such as Ion-Nitriding and carburization. Initially, all vacuum furnaces were electric, and electric still dominates the market. Gas units were developed in the mid-1980’s with research funded by GRI and the gas industry. Gas vacuum furnaces have several advantages over electric, including lower operating costs, lower first cost, and faster cycle time. However, a key disadvantage has kept it from taking over more of the market. Gas vacuum furnaces currently only operate up to about 1,950F (initially only to about 1,250F). Electric furnaces can operate up to 2,400F. Although an estimated 90% of all applications take place at less than 1,950F, this has been a barrier for the gas unit. Research continues in the higher temperature applications for gas. Currently, only about 25 gas fired vacuum furnaces are in operation. High temperature applications that are NOT possible for current gas vacuum technology includes: Sintering (tools and parts made from powdered metal and heated to about 2,400F to harden) and exotic alloy metals used in high temperature applications such as aircraft turbines. Typical gas vacuum furnaces have inputs of 1 – 1.2 million BTUs/Hour; electric furnaces are 150 – 200 kW. A batch process may run anywhere from a few hours to a couple of days, depending on the size of the load and what is being accomplished. An ideal vacuum is the absence of vapors, particles, gases or other matter. The absence of these materials would constitute an absolute pressure of zero. While this “absolute zero” is impossible, it is possible to get very close. Normally when the word vacuum is used it refers to any absolute pressure below that of normal atmospheric pressure. Atmospheric pressure is defined as 14.6 psia or 760 torr. Any pressure less than this is considered a vacuum. The heat treating process takes place inside a vessel that is airtight. The entire heat treating process can take place under vacuum or precisely controlled atmospheres can be introduced. Heat treating under vacuum can: prevent surface reactions, such as oxidation or decarburization; remove surface contaminants such as oxide films and residual traces of lubricants; add a substance to the surface layers of the work; remove dissolved contaminating substances from metals by means of degassing. 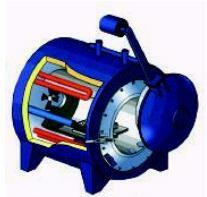 The Vacuum Pump is an integral part of the Gas-Fired Vacuum heat treating system. Typically a positive displacement pump is used for drawing the primary vacuum. These pumps are called roughing or forepumps. These pumps draw the initial vacuum on the pressure vessel and can take the vessel down to around 100 microns or 0.1 torr. Then a high-vacuum pump or finishing/holding pump will take over. These pumps can draw vacuum down into the 1 micron or 0.001 torr range of absolute pressures. Natural Gas is a more efficient and cost effective method of providing heat input to the heat treating process. Currently there are three distinct burner technologies for delivering gas produced heat to the product: Retort, Single End Tube, and U-Tube. Each of these technologies has its advantages and disadvantages. Retort – Indirect heating of a metal surface that radiates heat to the work chamber, on the side opposite of the burner. Single End Tube – The single end tube is usually inserted into the furnace through the end wall around the perimeter of the furnace. The gas fires down the center of the tube and the exhaust gases exit down the outside of the tube. The tube radiates heat to the furnace cavity. U-Tube – The U-Tube is usually inserted into the furnace through the end wall around the perimeter of the furnace. The gas fires down one leg of the U and the exhaust gases return down the other leg. The tube radiates heat to the furnace cavity. Currently, research is underway with new higher temperature radiant tubes. It is mainly the life of the burner tube that is the limiting factor in gas furnace working temperature range. Cooling of the product can take place in a number of manners. If the cooling takes place rapidly it is called quenching. Cooling – To cool a product inside the furnace cooling tubes can be used. These consist of tube shaped heat-exchangers that typically have water circulating through them as the coolant. A small circulating fan will circulate what ever atmosphere is in the furnace around the cooling tubes and product. Another method is to introduce an atmosphere into the furnace thereby cooling the product. If the atmosphere is introduced rapidly and to pressures above atmospheric this method can become a form of quenching. Quenching is the rapid cooling of a product to produce a desired property. Cooling the product rapidly can be accomplished in a number of fashions. The product can be placed into water or oil both of these methods will very rapidly cool it. Introduction of a high-pressure atmosphere will also rapidly cool a product and can have some other effects as the heated product interacts with the atmosphere. Cycle times are reduced (vs. electric) because natural gas provides 2-3 times more heat input. The high energy, natural gas radiant tubes coupled in some instances with convection fans bring loads up to temperature faster. GFVF systems eliminate the “Straight Line” or “Shadowed” heating effect, associated with electric heating. This more uniform heating allows for higher loading capacities of heavy, densely packed, or geometrically complex parts. Single chamber GFVF’s utilize internal cooling tubes and fans for cooling. Multi-chamber GFVF’s can remove work from the high heat vacuum chamber for quenching. Radiant tubes with new durable outer shells made up of super N22H alloy last up to ten times longer than electric heating elements. Some furnaces have been running continuously for over three years with no down time. GFVF treats materials in non-surface altering atmospheres which eliminates oxidation, decarburization and inner granular oxidation. These superior metallurgical properties help you to meet higher performance specifications. The furnaces also produce a high degree of work cleanliness, brighter part surfaces, and increased surface integrity. GFVF heats more uniformly because of the radiant and convection heating systems. Furnace temperatures range from 700ºF to 1950ºF and can be held to within minimal variations of +/- 5ºF. Automated burner management and cooling control systems tighten temperature targets and prevent episodes of overshooting temperature requirements. Gone are the non-uniform heating variations and part distortion associated with resistance heating. Electric furnaces are at a disadvantage because their elements are typically designed to operate above 2000ºF and cause shadowing and large temperature variations at relatively low temperatures. The use of sealed vacuum chambers, sealed radiant tubes, and gas quenching is increasing work place safety. Vacuum furnaces don’t leak combusting and toxic gases into the shop. For example, the radiant tube burners’ gases are recycled through heat exchangers and exhausted outside the facility. Gas furnaces are equal to or less in cost than their electrical counterparts and require fewer auxiliary systems to operate. For example, lower water usage eliminates the need for a cooling tower system. But if needed, a GFVF can be tied into existing systems since there is a minimal added cooling load. When comparing gas and electric installation costs, natural gas has the advantage because it does not require increased electrical service from the utility, larger electrical connections, or the skills / rates of large, licensed electrical contractors. The elimination of these requirements cuts costs since most in-house trades personnel can handle the gas piping and electrical distribution requirements of GFVFs. Operating GFVFs can cost as much as 30-50% less than their electric counterparts because the costs for natural gas energy and water usage are lower. As a rule of thumb, GFVF will consume twice as much raw energy (due to heated exhaust gases). However, the cost for gas energy is roughly $4.50 per million BTU while the cost for electricity is on average $20.50 per million BTU (at $0.07 per Kwh). Therefore, overall heating costs are about half of electric ($9.00 / $20.40 = $0.44). These savings are specific to temperature, furnace design, and process. Typical gas furnaces have inputs of 1 – 1.2 million BTUs; electric furnaces are 150 – 200 kW. A batch process may run anywhere from a few hours to a couple of days, depending on the size of the load and what is being accomplished. The hot-wall designs reduce or eliminate water for cooling. This also eliminates the usage of auxiliary systems such as pumps, motors, and cooling towers. Hot-walls have less heat loss than electric models. The water chambers used to cool electric furnaces also act as a heat sink. The furnace must work harder to keep heat from being pulled from the heated load. Condensation of water vapors and impurities on the inside of the furnace; condensation typically goes to the coldest spots in the furnace, usually at feed throughs, causing vacuum chamber leakage. No need to regularly tighten power supply or element wiring connections. Gas-fired radiant tubes also cut costs. They last longer than electric elements which can require replacement up to six times per year as opposed to one or two years for radiant tubes. The time needed to tune burners is less than what is needed to adjust or calibrate element power supply systems. Read a paper on ‘The Role of Gas Fired Vacuum Furnaces’ by Klaus H. Hemsath, one of the inventors of the gas vacuum furnace technologies. Also see Heat Treat Overview for an overview on heat treating processes, equipment and more links. Sources: TechPro DTE Energy 2001; Manufactures data from their web sites referenced and linked above 4/02.